Kathputli Nagar, Jaipur " The Puppet Maker Slum"
Kathputli Nagar is a slum situated in Jaipur, India, in the state of Rajasthan. It is located in a central part of the city, in an area with key governmental offices including the Rajasthan Housing Board, the Rajasthan Highcourt and the Employee State Insurance Office. Lack of opportunities in rural areas forces many peasants (mainly illiterate) to migrate to the cities in search of employment. As they usually do not have the money to pay for an accommodation, temporary structures on public land are being created, where no basic facilities like toilets, safe drinking water, electricity, etc. are available. The Government usually hesitates to provide these amenities, because this would mean acknowledging the existence of the slums, creating undesired liability towards the slum population; under these circumstances the Kathputli Slum came into existence about 55 years ago. Today, roughly 5,000 people live in that area, mainly Dalits but also Muslims, Scheduled Caste / Tribe, people from the Scheduled Caste / Tribe as well as some Christian families. 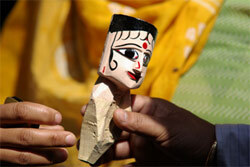 Main source of income is the crafting of the Kathputli puppets, sweeping or doing other kind of low-skilled work. Coming from lower strata of the society, and being more or less illiterate, most of the slum population is unaware of the importance of education, and has a more traditional view on castes and gender roles. While some of the people in Kathputli live in tents made of plastic covers, most of the slum’s population live in small, narrow houses constructed with clay, cow dung and concrete. Most of the roofs are covered in corrugated iron with rocks on top keeping everything in place. The houses are cramped and built attached to each other to make the most out of the small space. A typical family in this slum consists of 5-7 people living in houses with one or two small rooms, “kitchen” / cooking facilities are often outside the house, a small bathroom facility might be available, but usually there is no toilet. The women do the cooking with coal, "dung cakes" made of cow dung, firewood or gas and collect water from the government tap, while the husbands go to their workplaces to earn an income for their family. The people eat two meals a day, one in the late morning and one in the evening. A typical meal is made of the Indian bread chapatti and a seasonal vegetable. The people struggle with diseases as a result of bad hygienic conditions. The most common disease is diarrhea, but illnesses such as cholera and malaria spread easily among the people as well. In addition to this, infants suffer from malnutrition, so it’s not unusual to find examples of children dying at a young age in this slum. The garbage, animal excrements and dust overflowing in the streets contribute to bad hygienic conditions. As this area does not have a legal status whatsoever, the Government neither provides garbage bins, nor garbage collection. Most of the disposal is done by pigs, who find their food among the remains or by garbage collectors, who earn a living by collecting plastic. Bad sanitation is one of the main problems in the slum; while most of the families have only buckets they fill and wash from, others might have a small bathroom. Hardly any of the families have toilets in / or next to their houses, it is more common to go to the open field next to the slum, which is also used as garbage disposal area and playground. An open drainage system runs like a tiny river through the slum and creates dirty, slow-running water full of bacteria. During the rainy season, when the monsoon comes, the drainage system overflows and the water regularly floods the houses; when the bacteria get in contact with human hands, diseases easily develop. The government provides water from a tap that the people in Kathputli Nagar share, and which is used by the majority of the people, because only a few have separate taps in their houses. The water supply opens at set hours in the morning and evening time, giving the people the chance to get water covering the demand for the day. Education is a very divided matter in Kathputli Nagar; as you would expect, there are a lot of people (mainly women), that are illiterate and have no education whatsoever. But there are also those with a college degree, earning a good amount of money. It is very important to be aware of these variances and to remember that even in a slum, there are people who are highly educated. Involving these highly educated people in our initiatives can be of great impact, because with the positive example they set, they can serve as change catalysts. There is a school run by the Government in Kathputli Nagar, which offers education free of charge up to the 8th grade (up to age 14). Most of the children are enrolled in it, but this fact doesn’t say anything about the actual school visits. There is a huge number of children who do not go regularly or are dropping-out of school for various reasons e.g. because they have to support their parents in earning a living, because the parents are not supporting them to get an education, or – especially with girls – because they have to help with the domestic duties. In addition to the school the Government provides two Anganwadis / Day Care Centers (DCC), where infants get basic health check-ups, some food, and some pre-school education. These activities are not very formalized though and often lack continuity. The main overall problem area in Kathputli is a dissatisfying economical situation, caused by lack of education and / or training; therefore, "learning & earning" activities to improve this situation are in the focus of SAARTHAK’s initiatives. Moreover SAARTHAK provides support in setting up Self Help Groups (SHG), where the women organize themselves to save small sums of money regularly, thus contributing to a common fund, which is used to meet emergency needs on the basis of mutual help. The fund is also used to give out loans to individual women e.g. to buy a sewing machine, consequently supporting the women on their way to self-employment. Advocacy sessions are another vital part of the activities, where all women of the program get together to learn more about and to discuss issues, that directly affect them in their daily life e.g. family planning, infant care, health / hygiene awareness, knowledge of public welfare schemes, dealing with social customs (child labour, dowry, gender imparity, child marriage) etc. ; in addition, some fun activities to keep the women motivated and to reward them for their discipline and commitment complement the initiatives such as picnic in the park, watching a movie/dvd, henna making, dancing lessons et al. The learning and earning activities are taught by local teachers (some of them former participants of SAARTHAK’s initiatives such as Pinky, the tailoring teacher), and are further supported by international volunteers, who not only bring new and sometimes more creative teaching methods, but also a lot of enthusiasm to the project. Moreover the mere presence of the volunteers is an additionally motivating factor for the participants to join the classes regularly. There is a school run by the Government in Kathputli Nagar, which offers education free of charge up to the 8th grade (up to age 14). Most of the children are enrolled in it, but this fact doesn’t say anything about the actual school visits. There is a huge number of children who do not go regularly or are dropping-out of school for various reasons e.g. because they have to support their parents in earning a living, because the parents are not supporting them to get an education, or – especially with girls – because they have to help with the domestic duties. After dropping-out it is very difficult for them to go back to regular school, therefore SAARTHAK will run non-formal-education (NFE) activities preparing them for further formal education. Until recently no NGO was allowed to work directly in any Government school in Jaipur, but SAARTHAK was fortunate enough to be able to meet the minister of education of Rajasthan (Mr. Bhanwar Lal Meghwal) and to discuss with him directly the options for us to get involved. Hence we received the approval from the department of elementary education to look after beautification, to develop teaching materials, to offer class room teaching support, provide health & hygiene awareness campaigns and to improve sanitation if required. This is a major accomplishment, and we are organizing our activities at the moment, so as to get started on the ground as soon as possible.